Cops are searching for a man who flashed and punched random people on the street in Greenwich Village on Saturday night. A man who was denied entry to a church event exposed himself before attacking random people on the streets of Greenwich Village, police say. The 20-something-year-old suspect had been trying to enter a private function at St. John’s Lutheran Church Saturday night, but was denied entry, according to police. After being rejected from the church, the man flashed people and then went on a punching spree, police said. The man targeted three people on Christopher Street within the span of a few minutes, police said. The first victim was a 22-year-old woman who the suspect allegedly punched in the face at 10 p.m.
After that, the man punched a 35-year-old man in the face and then punched a 60-year-old man in the face, police said. 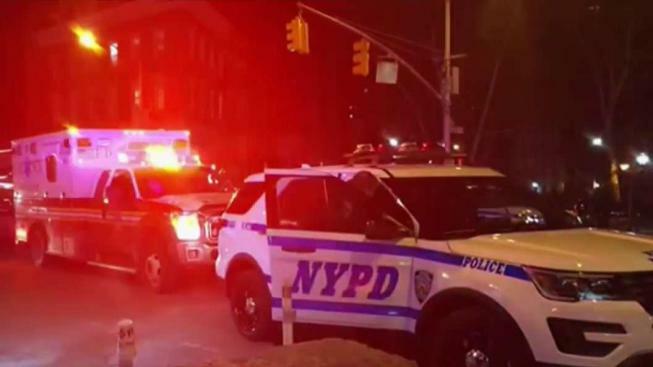 The 22-year-old woman and 35-year-old man were taken to Lenox Hill Hospital to be treated for lacerations to their lip and nose, respectively. The 65-year-old man had a laceration to his mouth but refused treatment. Police released surveillance images of the suspect on Sunday. They asked anyone with information to call the Crime Stoppers Hotline at 1-800-577-TIPS. Spanish speakers can call Crime Stoppers at 1-888-57-PISTA. People can also text their tips to 274637 (CRIMES) then enter TIP577.